Michel Montecrossa and his band the Chosen Few this year bring to the Spirit of Woodstock Festival (www.SpiritOfWoodstockFest.com) in Mirapuri the brand new songs of their ‘Courage & Love Climate Change Concert Tour 2009‘. 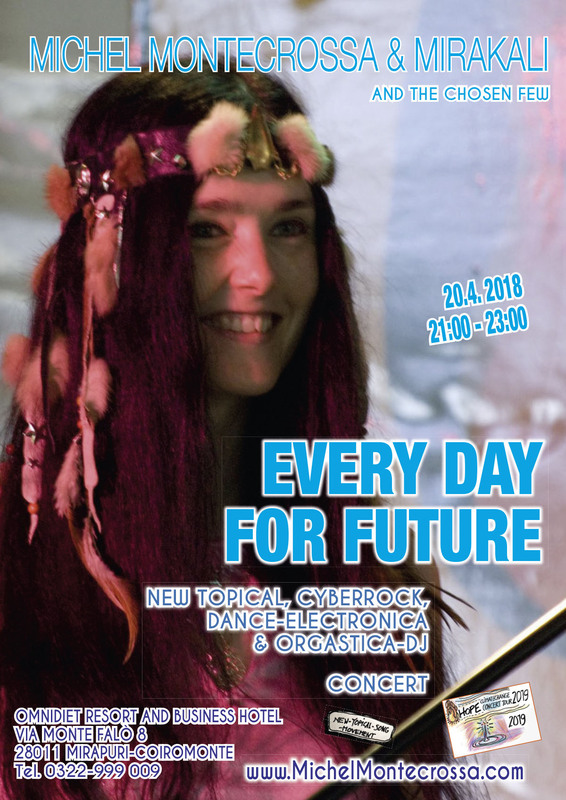 During the ten festival days they present a stunning concert series with Cyberrock and Climate Change songs under the title ‘Alternative Future’. “At the Spirit of Woodstock Festival 2009 in Mirapuri me and my band perform our 10 days ‘Alternative Future’ concert series. During these concerts we present topical songs dealing with the life on our rapidly changing earth and the impact these changes have on our future. When Michel Montecrossa is not in the studio working on new productions he is on the road together with his band ‘The Chosen Few’ (Mirakali, Diana Antara, Mirachandra, David Butterfield) presenting with his live-concerts – forty and more every year – a Cyber-Rock-Vision come true. Michel Montecrossa and his band are living in Mirapuri-Coiromonte, Italy. Their music is a continually evolving message, a Cyber-Rock dream come true. Every month they perform live at the Music-Hall of the Omnidiet Resort and Business Hotel in Mirapuri as well as at the Michel Montecrossa Rock Vision Diner in Gauting near Munich, Germany. They lead a life of friendship and experience, artistically expressing the impact of life and future possibilities. 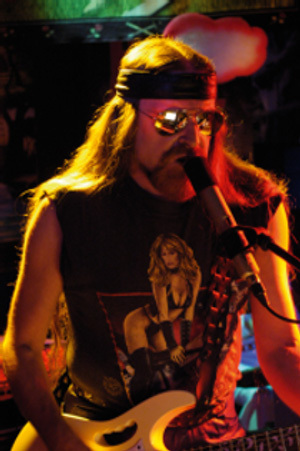 Michel Montecrossa and the Chosen Few continuously create new songs, new lyrics, new styles of performance. Every concert is a new Cyber-Rock Journey. It is fascinating to experience them and get the feeling of Cyber-Music which is not isolated in an alien world but part of a consciousness-expanding outlook on things and a practical way of life being more than an alternative to present conformity. Michel Montecrossa started the Spirit of Woodstock Festival which takes place every year in July / August in Mirapuri-Coiromonte in the North-Italian Mountains together with the Mirapuri Rainbow Gathering and Mirapuri’s one and only original Bavarian Oktoberfest in Italy. During the Festival Michel Montecrossa and The Chosen Few sing and play along with international guest-bands for a happy and enthusiastic audience. Michel Montecrossa wird während 10 Tagen vom 31.07. – 9.08.2009 auf dem diesjährigen ‘Spirit of Woodstock Festival 2009’ www.SpiritOfWoodstockFest.com in Mirapuri, Italien neueste Cyberrock and Climate Change Songs seiner ‘Courage & Love Climate Change Tour’ unter dem Titel ‘Alternative Future’ Concerts präsentieren. Das Spirit of Woodstock Festival findet vom 31.07. – 9.08.2009 auf dem Festival-Gelände der Hotel & Event-Location Omnidiet statt und bietet 10 Tage Live-Konzerte internationaler Bands & Eintritt frei & kostenlos zelten & freundliche Preise für Essen, Trinken und Hotelunterkunft. ‘Life For All’ – 9th CD of Michel Montecrossa’s ‘Courage & Love Climate Change Concert Tour 2009’ out now!! The ‘Life For All’ Cyberrock & Climate Change Concert, released by Mira Sound Germany as double Audio-CD and DVD is Michel Montecrossa’s ninth message concert of the Courage & Love Climate Change Concert Tour 2009 presenting 32 songs, including the title song ‘Life For All‘ and great rock songs like ‘Young Dream‘, ‘Fearless‘, ‘Stunning‘, ‘Loud And Proud, Sweet And Tender‘ and the electric version of ‘Life‘ as well as romantic songs like ‘Futuregirl‘ and ‘Eternal Love‘. Diana Antara contributes message songs like ‘Survive‘ and ‘Sweet Lover‘. 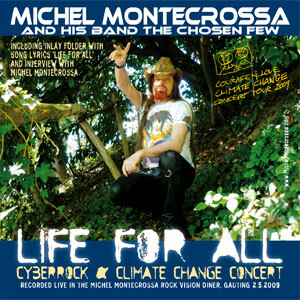 Mit der als Doppel Audio-CD und -DVD erhältlichen Produktion ‘Life For All’ präsentiert Michel Montecrossa die neunte Live-CD seiner ‘Courage & Love Climate Change Concert Tour’ – die sehr Cyberrock- und E-Gitarren-betonte CD bietet 32 Power-Songs, darunter u.a. der Titelsong Life For All‘ , Rock-Stücke wie ‘Young Dream‘, ‘Fearless‘, ‘Stunning‘, ‘Loud And Proud, Sweet And Tender‘ die Electric-Version von ‘Life‘ sowie das romantische ‘Futuregirl‘ und ‘Eternal Love‘. Diana Antara präsentiert Message Songs wie ‘Survive‘ und ‘Sweet Lover‘. 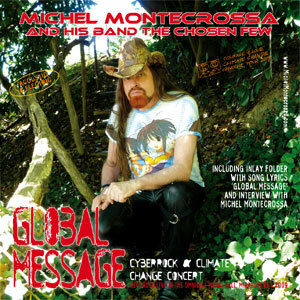 The ‘Global Message’ Cyberrock & Climate Change Concert, released by Mira Sound Germany as double Audio-CD and DVD is Michel Montecrossa‘s eighth message concert of the Courage & Love Climate Change Concert Tour 2009 presenting 29 songs, including the acoustic title song ‘Global Message‘ and acoustic theme songs like ‘Hey, Hey… This Man Is O.K.‘, ‘All The While‘ and ‘United Nations Of The Earth‘ as well as cyberrock theme songs like ‘Survivor In The City‘, ‘Powerhouse Of Consciousness‘, the touching ‘Planet Kid‘ and the heartfelt ‘Child Of Our Days‘ and ‘World Love Song‘. Mirakali and Diana Antara contribute message songs like ‘Courage‘ and ‘Voices Of Gaia‘. CD-Neuveröffentlichung: ‘Global Message’ – Michel Montecrossa präsentiert auf der achten Live-CD seiner ‘Courage & Love Climate Change Concert Tour 2009′ 29 Songs, darunter u.a. der akustische Titelsong ‘Global Message‘, die akustischen Themensongs ‘Hey, Hey… This Man Is O.K.‘, ‘All The While‘ und ‘United Nations Of The Earth‘ sowie die Cyberrock Themensongs ‘Survivor In The City‘, ‘Powerhouse Of Consciousness‘, das bewegende ‘Planet Kid‘ , das eindringliche ‘Child Of Our Days‘ und der ‘World Love Song‘. Mirakali und Diana Antara präsentieren eigene Message Songs, u.a. ‘Courage‘ and ‘Voices Of Gaia‘. Well, as you might have read already on this blog, the upcoming event will be Michel Montecrossa’s ‘Michel & Bob Dylan Fest’ from 22.05 – 24.05.2009 at the Omnidiet Hotel. Hier noch einmal alle Infos für das Michel & Bob Dylan Fest 2009: alle Termine, Uhrzeiten, Veranstaltungen.